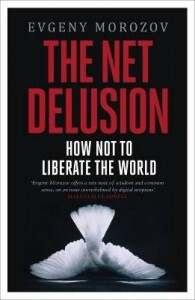 I started reading Evgeny Morozov’s The Net Delusion and find it very interesting. It is obviously very timely due to the recent events in Tunisia and Egypt. The book argues for a more sophisticated look at the role that social media can play in promoting socio-political change. I’ll try to write a full review when I’m done, but share one thought with Lee Siegel who reviewed the book for the New York Times; Morozov does exhibit “traces of the Eastern European intellectual fatalist gloom from time.” The book so far reminds me of my time participating in Vacel Havel’s Student Forum 2000, and learning about the NGO community (which Morozov actually belonged to) in Central and Eastern Europe trying to promote democratic values with a constant dose of cynicism and dark humor. In any case… a proper review will come in the next few days.